Prepping for the apocalypse with Fish Mox? I had started writing on WordPress for providing insight to my adventures on the road and in the home. With the discussion of Fish Mox, a fish antibiotic, some of my interests had converged into this one posting. One night, while watching an episode of Doomsday Preppers on cable, a fact had caught my attention. In preparing for the apocalypse, an individual had mentioned a survivalist tip of using fish antibiotics from a pet store. After finishing the show, I had jumped onto the internet to read about this possibility. Before proceeding, I had wanted to outline a couple of obvious statements regarding this discussion. I am not a medical profession, just some guy behind a keyboard. Always consult a medical profession when ill! Currently, I have the privilege of having decent healthcare. I don’t believe everything on the internet. I don’t believe everything on television. Continuing, my keen interest in fish antibiotics had come from traveling. I had really enjoyed being outdoors from hiking trails to fresh water springs to even a top of a mountain. Nothing I had dreaded worse than being on a road trip, or about to travel, then being stifled by some sinus infection or strep throat. After getting over my first cold at the beginning of the year, I had come to the conclusion of ordering Fish Mox (i.e. 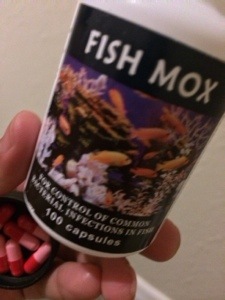 Amoxicillin) from fishmoxfishflex.com. 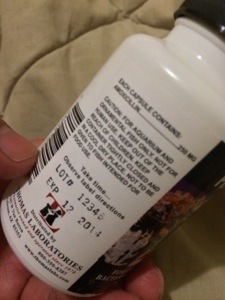 The deciding factors for the purchase were the online discussions relating to the quality grade of contents and pill labeling, despite the manufacturer stating for fish use only. For a few months, I had set this bottle in my kitchen corner. After a couple of trips, I had taken the sealed bottle with me. The opportunity for usage had finally arisen after a cold front this fall. The Sunday night following this change, I had developed congestion the next morning with an awful brown nasal discharge. At this point, I had decided to cycle on the Fish Mox. By day three, I had started to feel better. Some of my friends, during that same weather transition, had fared far worse. One had gone to the hospital receiving a prescription for Amoxicillin. The other, visiting a family doctor, had received the same prescription. 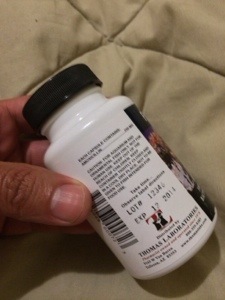 Being funny and smart, I had enjoyed seeing my doctor; however, for the price and time, in this case $30 for a bottle of Fish Mox, I had figured keep a container around in case of emergencies. This entry was posted in Health and tagged Amoxicillin, Antibiotics, Apocalypse, Fish Mox, health, Traveling. Bookmark the permalink. I always have a Z-Pac (Azithromycin) around for when I feel like it’s time to go see a doc(and a Medrol-Pac – methylprednisolone for when things are out of hand) . The problem lies when people use it anytime they have a cough or a sneeze. Over usage will lead ones body to adjust to it making the mox completely worthless and WHEN the day a superbug is released, the body’s ability to be boosted by the mox is no longer an acceptable resolution. This unfortunately has become the standard response by so many doctors these days.